Just as its name implies, 2014 Bowman Draft Baseball focuses on the latest draft picks who are taking their first pro steps towards their major league careers. As it has for more than a decade, the product mixes both Bowman and Bowman Chrome brands. 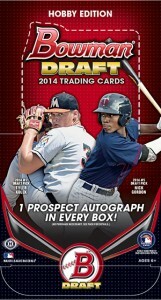 2014 Bowman Draft Baseball hobby boxes are highlighted by the promise of one autograph. This is in line with previous years, but down from the two guaranteed in 2014 Bowman Chrome Baseball. Leading the way are Chrome Draft Pick Autographs. These are the first cards to feature 2014 picks in their MLB uniforms. 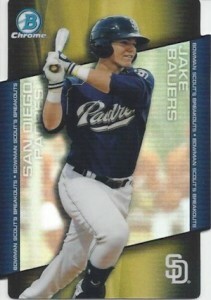 Parallels come in a mix of Refractor colors: Blue, Green, Gold, Black, Orange, Purple, Red and Superfractor. They also have Printing Plates. 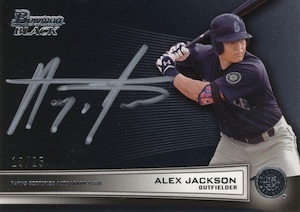 Many of the other autographs in 2014 Bowman Draft Baseball continue sets started with other products during the year. Bowman Black (#/25) returns with its distinct look and a new lineup of prospects. They have Violet (#/10) parallels once again. AFLAC, Perfect Game and Under Armor Autographs feature some of the earliest signatures of players as they were signed in the past at the special high school events. The Bowman brand has never been huge into relics and memorabilia cards. The only ones here are numbered Futures Game Relics. These include jersey swatches from the 2014 SiriusXM All-Star Futures Game, a mid-season event that spotlights top minor league talent. These have one-of-one Black parallels and Jumbo-exclusive Red parallels (#/5). 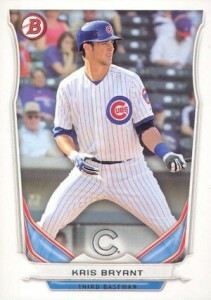 There are 220 base prospect cards in the product for both Bowman and Bowman Chrome. As you'd expect, there are several levels of parallels. For Bowman, these include Blue, Red, Black, Silver Ice, Red Ice, Purple Ice, White Ice, Orange Ice (Jumbo exclusive)and Printing Plates. Besides basic numbered Refractors, among the other Chrome parallels are Blue Refractors, Green Refractors, Gold Refractors, Black Refractors, Orange Refractors, Red Refractors, Printing Plates and Superfractors. Wave Refractor hots packs are back. These have their own assortment of parallels that come with a hard-to-mistake textured design. The 1989 Bowman Is Back Silver Diamond Refractor insert set carries on as it has with other 2014 Bowman products. These use the 1989 Bowman Baseball design but with current players. Superfractor parallels can also be found. 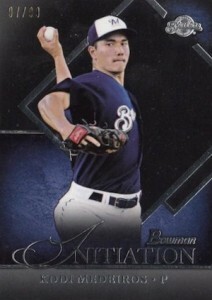 New to 2014 Bowman Draft Baseball are Initiation inserts. These numbered cards are intended to commemorate players joining the Bowman fold. The product has a handful of other basic insert sets as well. 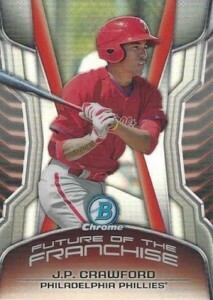 Future of the Franchise Mini Chrome cards focus on a top prospect in each organization. Black parallels are exclusive to Jumbo boxes. Dual Draftees pair up two 2014 draft picks that have a common bond. Draft Night uses pictures from the 2014 MLB Draft. Bowman Scouts' Breakouts is highlighted by a die-cut design. Dual Draftees, Draft Night and Breakouts all have autographed parallels as well. In addition to basic hobby and jumbo boxes, 2014 Bowman Draft has new Super Jumbo boxes that come with an autograph in every other pack (five total autographs per box). Besides a bigger pack (43 basic Bowman and 17 Bowman Chrome cards), they have a few exclusives: Base Green Paper parallels, Super Jumbo Refractors (base, prospects and Chrome Prospect Autographs), Future of the Franchise Red parallels, and 1989 Bowman is Back Red parallels. ICE PARALLEL CARDS: Silver Ice, Red Ice #/150, Purple Ice #/99, Orange Ice #/25 (Jumbo), White Ice 1/1 (Hobby). 71 cards. Click here for a detailed breakdown, player info, gallery and much more. Here are the top 5 deals on jumbo boxes currently listed on eBay. Here are the top 5 deals on super jumbo boxes currently listed on eBay. 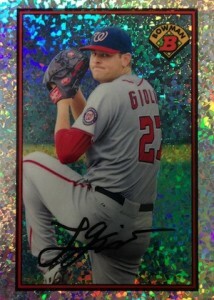 Good: Lots of high draft picks, lots of Refractors, compelling inserts. Bad: Just one autograph per box, lack of base set. The Bottom Line: 2014 Bowman Draft Baseball certainly has the 2014 draft covered — at least the first couple of rounds. This year, things have been reconfigured a bit. Rather than being a draft pick, prospect and rookie hybrid, 2014 Bowman Draft sticks almost exclusively with the draft aspect. And the intentional focus makes it the strongest of the main Bowman sets this year, even if that’s going to take a little getting used to. 2014 Bowman Draft Baseball doesn’t have any surprises in the design department. And nor should it. It keeps the overall look and feel of the earlier 2014 Bowman and Bowman Chrome sets. And while it’s not the most exciting of looks, it’s not horrible either. It’s fixed one of the issues from last year by bringing back the 1st Bowman notation. Also, the enhanced visual stats on the back that started with Bowman Chrome return. The Chrome Draft Picks Autographs are all on-card, which is tough to complain about as well. Where I think the Bowman brand as a whole can step things up in the design department is making basic inserts more meaningful and interesting. With Refractors taking most of the thunder, it’s going to be tough to have any other inserts emerge from the shadows. Future of the Franchise minis and Bowman Scout’s Breakouts both illustrate this in Draft. Future of the Franchise feels like a token Refractor mini that seems to be showing up in every set. They look fine enough, but the focus could be tighter. As for Bowman Scout’s Breakouts, I’m really struggling with this one. The card stock is plain and there’s not a lot of added info on the back. The one insert that really stands out for me is Draft Night. The overall design is nothing exciting. However, the content makes it a great set. Each has a shot of a player as they’re getting selected. As a result, the cards capture a moment. This moment and its accompanying shot trump the rest. As with any prospect-driven baseball set, there’s a caveat that it’s going to take some time for the star players to emerge. And lots won’t. But for the time being, 2014 Bowman Draft does a fantastic job of nabbing autographs from virtually all of the available first round picks and lots of second rounders as well. This comes with a shift. In the past, the set has been leaning towards draft picks but sprinkled in autographs of other prospects as well. 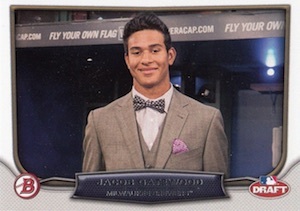 With 2014 Bowman Draft, Topps appears to be going all in. It’s going to take a few years to see the impact but if they keep including virtually all the key picks and not holding them back for the next year’s Bowman like Kris Bryant was this year, Draft is going to get stronger. For those expecting some rookie content, it might take some getting used to. It’s also going to take even more prospecting savvy to separate the likely stars from the pretenders. Even if prospecting isn’t my main collecting passion, I’m always a fan when a brand or set goes to great lengths to add focus. This might distance some collectors, but it often makes for an overall stronger product. I’m still amazed that outside of 2014 Bowman Chrome, that the other base Bowman sets haven’t expanded to two or more autographs per hobby box. Both Panini and Leaf have sets that deliver plenty of prospect autographs so it can be done. I guess on their end it’s a case of the formula not being broken. If you’re busting 2014 Bowman Draft for the autographs, it’s probably best to look to the secondary market or the more ink-heavy Jumbo and Super Jumbo boxes. One thing I did like about Bowman Draft over the two earlier base Bowman sets this year is that there seems to be a lot more Refractors. Even if they’re not rare, it’s nice to have a nice assortment when you’re done breaking a box. I get that they might not be worth much on the secondary market, but that’s not where I derive a lot of where value comes from. There’s the experience as well, which Bowman Draft was well balanced, I thought. Of the three main Bowman baseball releases in 2014, this one’s my favorite. It has a tight focus and lots of Refractors, which makes for a fun break even when all signs point to your lone autograph being one of the weaker ones in the set. The product will be amazing, another decent draft class… hoping gareth morgan somehow sneaks through the list …..
No prospects? Just draft picks? Any reason given for that change? I give it a 1 star do to my likelihood of buying this. At one time Bowman Draft Picks and Prospects was my favorite sports product but since Topps stopped making it available in Retail and only available in Hobby – I’ve stopped buying this product. I have always loved draft but I feel it has slipped some in recent years. First topps lost the USA team rights and last year there were 3rd rounders in the auto lineup, used to be just 1st rounders. However, this has always been my favorite and continues to be so. Anyone hear if Gordon has signed? Is there a base set of rookie cards like in previous years? The Draft Pick Set Checklist shows 130 cards yet the cards are numbered to DP132. I quick look shows NO numbers DP13 & DP31. Has this been verified? It’s nice to know while trying to build a set, but years later it is forgotten that numbers were skipped. Very frustrating! Dave S � The checklist is from Topps, so it’s about as verified as can be at this point. bought my annual case and was a little disappointed b\c now the autos have 6th rounders and they took out all the rookie cards. no rookies is not the best idea in the world. Draft has been slipping in recent years. 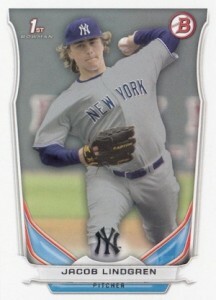 No more usa players, or rookies, what next cut out the refractors! Any idea whats going on with this? David B � Just did a bit of research — the black border cards are exclusive to distributors in Asia. It’s likely this was only for hobby and not the Jumbo and Super Jumbo boxes though. No rookies cards really hurts this product to me. For some players over the recent years that was the only RC they had. no rookie cards hurts the product and not as great as last year product. Excellent product. Best of the year. Bowman is always an exciting product. I specifically like collecting color autos and parallels of these prospects, so if you’re like me, I definitely recommend this product. 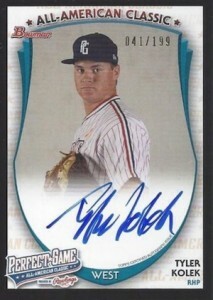 Also, there is a black wave auto #’d /15. I pulled one. First off seems like they made a lot of this stuff ! Are we going back to the 80s and 90s flooding the market ? What will the card be worth if someone in this set hits its big ? Not much too much made. Reg, jumbo, super jumbo !! I mean this product is definitely being over produced…what product isn’t? Trinity baseball went from an awesome product last year to adding 2 boxes/case and perfect game(that they already have a product for) and junk! Bowman, BC, bowman draft is practically the same product released 3 different times a year. And then they put ’13 BC Bryant in ’14 Inception? If that isn’t a ploy to sell more product I don’t know what is. And what’s even worse is everyone buying these Bryant’s for $1k then getting them graded and asking $20k on eBay! A Jeter ’93 SP PSA10 books at $50k and all of a sudden a player who hasn’t even hit a major league pitch is worth half of a HOFs RC costs?? And theirs 500 variations of Bryant’s cards its sickening! What’s even better is on another forum/site they talk about weighing the boxes to tell which ones(boxes) have toppers…if that’s not searching I obviously don’t know who Derek jeter or kris Bryant are! Are the dual draftee autos all redemptions? And is their just 5 or did every product have a different #? 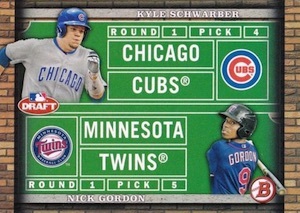 Guess I’m wondering if the Schwarber/Gordon is #/25 or less/more or not #d? 3 Average by Bowman standards. Too many no-name autos. 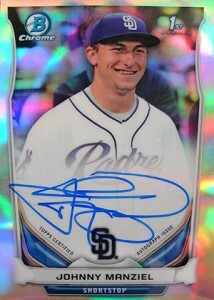 I had reconciled to the missing DP13 & 31 then suddenly I pull a CDP31 Johnny Manziel-Padres card. I am wondering the same about Garciatheone’s post; Can we confirm if these redemptions of dual draftees are numbered or not? Also are some/all stickers like last years? Still haven’t seen any from Topps pop up except for the blue redemption cards. Any info would be greatly appreciated!!! 2014 BOWMAN DRAFT BASEBALL SEALED HOBBY BOX Rhys Hoskins, Trea Turner RC NEW!